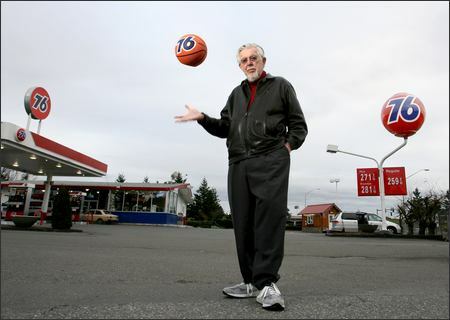 76 Ball designer Ray Pedersen has been informed by ConocoPhillips that they wish to honor his contribution to the brand's history by presenting him with one of the classic orange and blue 76 Ball gas station signs for his personal collection. Ray is trying to find the best place to store this large and lovely artifact, and we hope to report back to you soon with additional details. Kudos to CP for recognizing Ray with this generous and gracious offer! In recognition of this cool news, Ray Pedersen has kindly agreed to personaly autograph a very limited number of 76 Ball antenna toppers, which we are making available to his fans. If you would like one, just click.